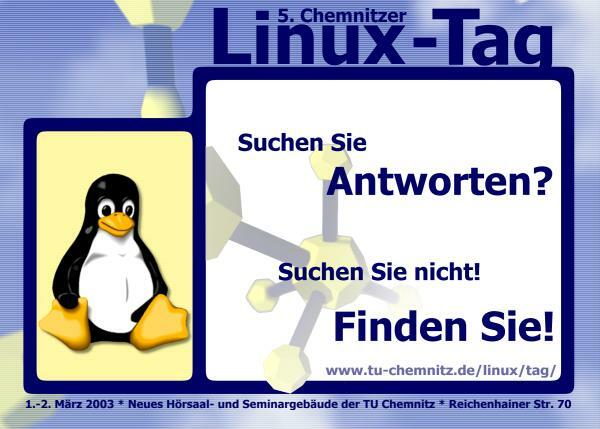 With the slogan "Living freedom" visitors were invited to get inspired by the Linux-Live area, the Surgery Dr. Tux and presentations in order to design their systems at home according to their own imagination and needs at this year's Chemnitzer Linux-Tage. In addition to well known attractions like the Linux-Night or the PGP-Party, the service-repertoire was extended by the OTRS-Community-Meeting and a separate tour around the venue for children. The Business-Forum was new at the Chemnitzer Linux-Tagen 2010. Commercial vendors of Open Source Software were able get in touch with each other and talk about ideas or their future plans. Those visitors who weren't able to attend the event in person could easily watch all 5 lecture sections live as video stream at home this year. Since a long time again on a second march weekend. Our guests didn't get confused by this fact and came countless to the event. For the first time some lectures were broadcasted as a live video stream. The Opener-Party on Friday, appealed to a lot of attendees.